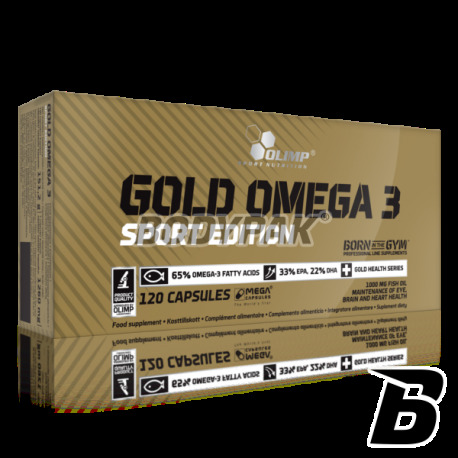 Health & BeautyOlimp Gold Omega 3 Sport Edition - 120 kaps. The fatty acids that occur naturally may contain from 4 to 26 carbon atoms. Among them we distinguish the fatty acids: saturated, monounsaturated and polyunsaturated. Omega-3 belongs to the group of polyunsaturated fatty acids. While the de novo synthesis of saturated fatty acids and certain unsaturated possible in the body is omega-3 must necessarily be supplied from the diet. This is because we lack the appropriate desaturase enzymes (enzymes that are able to synthesize fatty acids linoleic and α-linolenic acid), hence they are called essential fatty acids (EFAs). 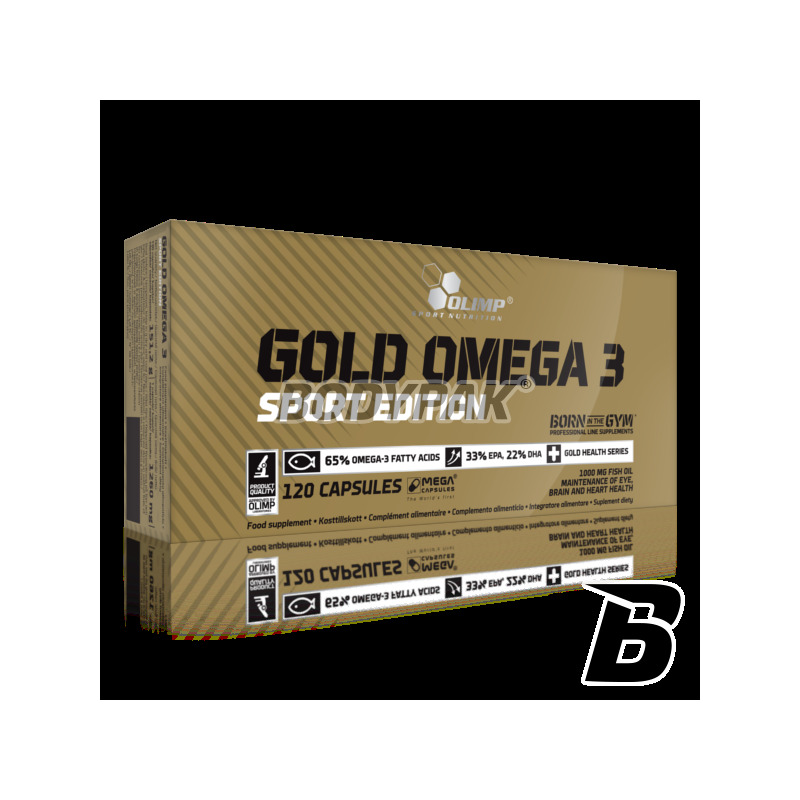 It is difficult to provide adequate number of them from the diet, especially if we active lifestyle, which is why we have created a dietary supplement Gold Omega 3® sport edition. The proportions of fatty acids in the human diet have evolved over the years. Currently in developed countries it scares unsuitable ratio of omega-6: omega-3, which varies between 30: 1. This is due to excessive ingestion of vegetable oils rich in adverse operating prozaplanie and omega-6 acids. Such large disparities, can cause many diseases: atherosclerosis, strong inflammation and allergic clots or even the development of cancer cells. Suitable health proportions of fatty acid should be kept at 1: 4 - 1: 1 (n-3: n-6). Therefore, it is important supplementation with omega-3. The right amount of these acids can prevent disease and bring enormous health benefits. The two most important and most active acids present in the supplement Gold Omega 3® sport edition is eikozapenaenowy acid (EPA) and docosahexaenoic acid (DHA). Many studies have shown that taking even small doses of omega-3 has a beneficial effect on the work of the cardiovascular system. In addition, the dietary intake lowers triglycerides and elevated levels of high-density lipoprotein, or "good" cholesterol (HDL) and decrease in blood clotting. Thanks to increased permeability and fluidity of cell membranes. How omega-3 affect serum cholesterol and cardiovascular disease? Results of several studies have shown that taking low doses of omega-3 fatty acid has a beneficial effect on the operation of the cardiovascular system. Additional their dietary intake lowers levels of triglycerides and an increase in beneficial HDL cholesterol and decrease blood clotting, which has a protective influence on the heart and circulatory system. How does omega-3 prevent inflammation, thrombosis and atherosclerosis? Omega-3 fatty acids increase the level of platelet aggregation inhibitor, or prostaglandin-3 (PGE 3). Additionally, EPA and DHA increase the concentration of tissue plasminogen activator, which is a thrombolytic substance that causes dissolution of the clot., At high doses, they may be useful in the treatment of thromboembolism. Supplementation with omega-3 also inhibits the synthesis of pro-inflammatory cytokines include TNF-α or IL-1. Gold Omega 3® sport edition is the ideal choice for injuries and problems with joints. How does omega-3 support the functioning of the nervous system? The fatty acids of the omega-3 family are responsible for the proper functioning of neurons. They are an important component of a highly nervous tissue, especially the cerebral cortex and retina. DHA ensures proper operation of the proteins responsible for transmitting and receiving nerve impulses. A large amount of DHA in the membrane of neurons increases in the amount of fosfadyloseryny providing a better survival of nerve cells and the resistance to noxious agents. Increase their consumption effectively improves mood, and also plays an important role in nervous system development. Are omega-3 can help reduce body fat? Omega-3 fatty acid is one of the key components of a diet supporting slimming. In people regularly consume the recommended dose of omega-3 found a weight loss of body fat and a decrease in BMI. Omega-3 acids have an inhibitory effect on the formation of adipose tissue, and actively mobilize its disintegration. How does omega-3 acids protect the liver? Recent reports confirm the effectiveness of the omega-3 in inhibiting the growth of tumors of the liver, increase the effectiveness of chemotherapy and protection from the toxic effects. Unquestionably, so supplementation Gold Omega 3® sport edition will be recommended to people who have used illegal doping, causing disturbance of the body's internal balance. The optimal dose and time of use: 1 capsule daily, preferably with a meal containing fat. Do not exceed the recommended daily servings for consumption during the day. Food supplements should not be used as a substitute for a varied diet. Gold Omega 3® sport edition is best used with a pro-health supplements brand Olimp Laboratories. With hard training should also take care to supplement the vitamins and minerals in properly selected research for athletes quantities: Vita-Min Multiple Sport ™, Chela MZB® Sport Formula, Chela MIN® Sport Formula. 1 capsule daily, preferably with a meal containing fat. Do not exceed the recommended daily servings for consumption during the day. Olimp Erekton Fast - 8 tabl. Every real man knows how to deal with problems. If you are looking for an effective way to support your sexual ability - just look for a supplement that seamlessly support you in the quest for success!